The United Kingdom has a vast array of counterterrorism tools to chose from, but will it be able to adapt to the growing and changing threat of terrorism? 2017 was an exceptionally deadly year in the United Kingdom’s fight against terrorism. Five attacks altogether claimed the lives of 36 people. This increase in terrorist activity together with the rise of right-wing violence and the return of British foreign fighters are likely to make matters worse. British intelligence and security forces will have to adapt to these new challenges in order to preserve national security. Terrorism is not new to the United Kingdom. Since the end of the 19th century, the UK has had to face terrorist attacks from anarchists as well as the Irish Republican Brotherhood (IRB), an organization with the aim of creating an independent democratic Irish republic. With the Irish War of Independence (1919-1921) and the establishment of the Irish Republican Army (IRA) violence increased. Though the IRA first launched a guerilla war against the UK government in Northern Ireland, they eventually expanded their operations to Great Britain. The end of the 1930s and beginning of the 1940s saw the IRA’s first major campaign on Great Britain’s soil, where they carried out almost 300 attacks and acts of sabotage. Without going into the history of the IRA and their insurgency in the UK, it is important to highlight that their activities against the UK peaked in the 1970s–1980s. During this, the Provisional IRA (the successor of the original IRA, established in 1969), led an effective and bloody armed campaign using insurgent and terrorist methods (mostly by bombing public spaces) to fight British oppression both in Northern Ireland and Great Britain. The preparedness of the British police and intelligence services to fight this kind of threat dates back to these times. Islamist terrorism did not emerge in the UK until the new millenium. The first Islamist attack hit the London metro in 2005, when three separate bombs were detonated in three separate underground stations, killing 52 people (and the perpetrators), while injuring around 700. Since then, nearly the same number of people have died in terrorist attacks mostly motivated by Islamism, with a maximum of one or two attacks per year. However, there are certain new tendencies on the rise that can complicate the UK’s fight against terrorism in the future. Compared with previous years, 2017 was an exceptionally deadly one for the UK. 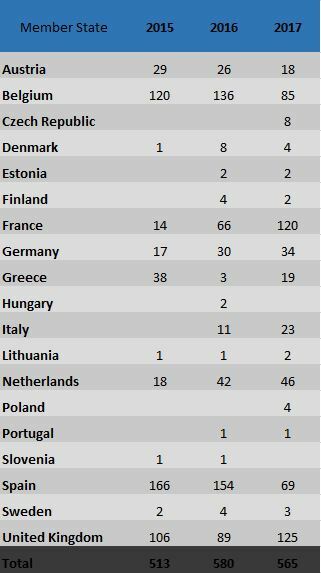 It was the country that endured the most terrorist attacks in Europe, according to the new EU Terrorism Situation and Trend Report by European crime agency, Europol. Altogether 36 people lost their lives in the UK in five (Islamist and far-right) attacks in Westminster, on the London Bridge, Manchester Arena and Finsbury Park. Though terrorist attacks inspired by the jihadi ideology of the Islamic State still remain the biggest threat, far-right violence “fuelled by fears of a perceived Islamisation of society and anxiety over migration” is also on the rise. Contrary to the tendencies in France, the UK has seen a rise in terrorist attacks in the past years: after two attacks in 2013 and one in 2014 and 2016 each, 2017 saw a high number of foiled and completed attacks, altogether 19 (excluding the 88 separatist plots in Northern Ireland seen in the table below). Out of the 14 jihadi plots, four were successful attacks and ten were disrupted, while security and intelligence agencies have also successfully foiled four extreme right-wing plots out of five. Even though jihadists have proven to be able to carry out complex mass casualty attacks (such as the November 2015 attacks in Paris or the one in the Brussels metro the following year), in the UK, attacks have generally been carried out by a single perpetrator (on four out of five occasions) with rudimentary weapons (such as driving a van into a crowd or with a knife). This is due to the fact, that terrorists face a greater challenge in crossing the UK border as well as the low availability of illegal firearms in the country. This is not to say that a single perpetrator could not carry out a large scale mass-casualty attack. In fact, there has been one in the UK last year, when a lone attacker blew himself up with a suicide bomb outside the Manchester Arena, killing 22 and injuring 139. Though the term “lone wolf terrorist” has become widely refuted when talking about single attackers (nobody is really alone, most perpetrators belong to, are helped by or keep contact with a network of other like-minded individuals), this year’s review of the UK’s counterterrorism strategy (CONTEST) has concluded that the UK is witnessing a rise of what is still categorized as “lone wolf attacks.” Since in these cases connections to others are limited and, therefore, there is a lack of detectable communications, it is much harder to identify and disrupt these kind of attackers, especially if the process between radicalization and the terrorist act takes place in a short period of time. The UK government estimates that the number of its citizens who have left to fight for the Caliphate is around 900, of which approximately 20% (180 people or so) have been killed and 40% (about 360 people) have returned. The UK is known to take a hardline approach when dealing with foreign fighters, implementing “hard policy measures” ranging from the confiscation of travel documents to revoking citizenships. Most of the returnees who are caught entering the country are given a prison sentence and do not participate in disengagement programs. Right-wing terrorism is also a growing threat in the UK. In December 2016, the then Home Secretary Amber Rudd, proscribed National Action. The Government took further action in September 2017, proscribing Scottish Dawn and National Socialist Anti-Capitalist Action (NS131) as aliases of National Action. This was the first instance where a far-right group was banned in the UK since the end of World War II (there are in total 88 terrorist organizations proscribed in the UK, 14 of them linked to Northern Ireland). Prior to the emergence of National Action in 2014 (it was founded a year before), right-wing and neo-Nazi extremism was marginal in the country and its membership was low, confined to old members who held anti-immigration and white supremacist views. According to Duncan Atkinson QC (a prosecutor involved in the sentencing of the two of the group’s members for plotting to kill MP Rosie Cooper and a female police officer earlier this year), since National Action came to prominence four years ago, it has been engaging in a campaign of “virulently racist, anti-semitic and homophobic propaganda through which it sought to stir up a violent race war against ethnic minorities and others it perceived as race traitors.” At the height of its activities National Action had a membership of a hundred white young men who mainly organized demonstrations and marches. This was until 2016, when the group raised the bar of violence with one of its members murdering Labour MP Jo Cox. As a result, the group was banned shortly afterwards. Since then, it has been easier to charge and imprison its members on terrorism charges and, indeed, 27 individuals have been arrested on the suspicion of being members, 15 of whom were charged with offences related to terrorism. Though the threat from Islamist terrorism is still the main security concern in the UK, the importance of right-wing extremism should not be downplayed either. Even though National Action has been banned, its members set up front organizations that continued the group’s “legacy.” After they also have been banned, their websites, recruitment videos and propaganda have remained active on the internet. A marginal problem in Great Britain (but not in Northern Ireland), ethno-nationalist terrorism also remains a threat. Though geographically limited, ethno-nationalists or separatists (or “violent dissident republican terrorist groups” as they are referred to by the UK government) have managed to carry out 88 attacks last year, according to Europol’s report. While they mainly target the Police Service of Northern Ireland (PSNI), prison officers and the Armed Forces, the nature of their attacks (the use of under-vehicle explosives or close-range drive-by shootings) endanger civilians as well. The United Kingdom has an extensive legal framework in place for the prosecution of terrorists, a framework that has been constantly broadening in the past years. The Terrorism and Counter-Terrorism Acts of 2000, 2006, 2008 and 2015 are complemented by the Terrorism Prevention and Investigation Measures Act of 2011 for dealing with terrorist suspects who cannot be prosecuted. In addition, the Anti-Terrorism, Crime and Security Act of 2001 and the Terrorist Asset Freezing Act of 2010 were created (from a number of precedens dating back to countering the financing of the IRA and drug-trafficking in the ‘70s and ‘80s) to combat terrorism financing. Most recently, the Policing and Crime Act also introduced a range of measures to improve the efficiency and effectiveness of the police. To follow the increase in terrorism-related activities, the UK also stepped up its efforts in prosecuting individuals on terrorism related charges. Due to large-scale police operations following last year’s attacks in Manchester and London, the number of terror-related arrests hit a record high of 441 between April 2017 and 2018. In 2017, the UK has also prosecuted and convicted a record number of terrorists, 125 (this number includes proceedings on offences under anti-terrorism legislation, as well as other offences assessed to be terrorism-related) according to the Europol report. A police spokesperson said they were also using disruption tactics by arresting suspected extremists for non-terrorism criminal matters like fraud, robbery and drugs offences if there is not enough evidence for a terrorism charge. This tactique, together with imposing longer prison sentences, aims to keep terrorist suspects off the streets and under surveillance, even after their release. As a result, 228 people are currently imprisoned for terror offences in the UK, with Islamist extremists making up the majority (82%), followed by far-right activists (13%) and those driven by other ideologies (6%), including Irish separatists. The average prison sentence length for terrorism offences in the UK is five years, which seems to be the same as the EU average, according to Europol. Since this is a relatively short sentence, the high number of convictions means that in five years, a lot of people sentenced on terrorism charges will be set free, all at the same time. This is a serious concern as, just this year, more than 80 of the 193 sentences issued for terrorism offences between 2007 and 2016 will expire. This number could be even higher as convicts can be deemed eligible for release mid-way through their sentence. In addition to all of this, the recent capture of the last members of the infamous British terrorist cell ‘The Beatles’ brought attention to the difficulties in prosecuting foreign fighters, especially those who have not returned to their home countries, but were captured by coalition forces in Iraq or Syria. Currently, most European countries are reluctant to allow their citizens to return in order to face prosecution at home. Some, such as France, prefer French foreign fighters being prosecuted in countries they have been captured in, even though there they might not have access to appropriate legal protections. Earlier this year, Junior Defense Minister Tobias Ellwood called for an agreed international process involving the International Criminal Court (ICC) in The Hague, which would ensure that terrorists from any origin are transparently and fairly held to account for their actions, in light of the lack of consensus among Western governments. Though there are concerns regarding the ICC’s authority and capacity to deal with thousands of foreign fighters, it could bridge differences that exist between national legislations and create a transparent and equal procedure for all terrorists regardless of their origins, while bringing a neutral verdict with the participation of the international community. Protect (protections of key infrastructure, such as nuclear power plants, from terrorist attacks). One of the reasons CONTEST was updated is to address the threat of returning foreign fighters. The majority of those who have decided to leave the war behind and go back to the UK have returned in the early stages of the conflict. These people (mostly women with young children) were investigated and a significant proportion of them have been assessed to be of no national security concern, according to the findings of the 2018 review of CONTEST. It is assumed, that the most dangerous terrorists of British origins remain on the battlefield. Though the scope of CONTEST is comprehensive, there is a major gap in it. The UK has no real disengagement program that would be suitable for foreign fighters who have returned but cannot be prosecuted (either because they have not committed crimes that call for a prison sentence or due to a lack of evidence). Even the text of CONTEST highlights that the focus is on stopping people who are suspected of wanting to leave. There is little attention given to those who have returned, despite the fact that there are still hundreds of Britons abroad engaged in terrorist activity. Despite the fact that the UK has one of the most comprehensive and ambitious counter-radicalization programs in Europe, the Prevent program, aimed at challenging extremist ideas and influence via local organizations, has been highly controversial and has received plenty of criticism since its launch in 2003. Dr. Lorenzo Vidino and James Brandon’s 2012 article Countering Radicalization in Europe highlights some of the weaknesses of the program. Apart from concerns over the allocation of funding (often for inefficient projects), other religious communities in the UK, such as Sikhs and Hindus, groups expressed concern over the program negatively affecting inter-community relations, as it creates a sense of victimization within the Muslim community and a growing sense of marginalization in other religious communities. Concerns were also raised regarding extremists potentially receiving funding through the program, as a result of Prevent’s decentralized approach and loose supervision. Under Prevent, he so-called Channel program focuses on halting the process of radicalization by encouraging those witnessing it (such as teachers, family members, police officers, youth services or local community leaders) to refer the individual for intervention. The UK government made it a legal obligation for prisons and schools to report extremist radicalization to the program, as an answer to the increase of returning foreign fighters. Thanks to this measure, the number of referrals went up drastically the past couple of years, at the same time highlighting a major side-effect of the program. Though Channel is still widely considered as more efficient than the general preventive work carried out by Prevent, teachers complained that it creates “suspicion in the classroom” and turned education professionals into “the secret service of the public sector.” The pressure to monitor students led to an excess of referrals with children as young as four years old, flagged for suspicions of radicalization. Apart from schools, prisons also became targets of increased monitoring for suspicions of radicalization – rightly so given the number of convicts and the number of those who will be set free. Apart from the prevention and referral system of the Prevent and Channel programs, there were additional efforts put in place to combat radicalization in prisons. However, one of the problems with these programs is the lack of a long-term vision. People who are prone to being radicalized are “flagged” and referred under Channel, leading to a multi-agency panel gathering further information and establishing the level of vulnerability and type of support needed. This support ranges from assistance with education or employment, to providing vulnerable individuals with the skills to protect themselves from being drawn into terrorism-related activity (such as social skills to deal with peer pressure). On the other hand, there are no adequate measures in place for those who have completed their prison sentences or have returned from Syria or Iraq but were never convicted. To this end, the UK introduced so-called Terrorism Prevention and Investigation Measures (TPIMs), which are enforced upon individuals whom authorities are unable to charge or deport due to lack of evidence. These measures include electronic tagging, regularly reporting to the police, exclusion from particular places and the interdiction of travel overseas. The lack of focus on de-radicalization remains a major deficit of Prevent, and CONTEST overall. returnees from conflict zones who are subjected to Temporary Exclusion Orders (TEOs, a measure that bars entry into the UK for up to two years). Through the DDP, authorities provide a range of intensive tailored interventions and practical support, including mentoring, psychological support, theological and ideological advice, in order to insert the radicalized individual back into society (by re-establishing self-esteem, identity, purpose in life and so on). A step in the right direction, the DDP aims to target those who are not covered by other areas of the CONTEST strategy. As positive as it is to focus on prevention, the need for a disengagement program becomes more pressing, especially because convicted terrorist are coming out of prison and former foreign fighters are returning home. The terrorist threat in the UK does not decrease, on the contrary, with the rise of right-wing terrorism and the increase of “low-budget” attacks, security could possibly get worse in the future. Even though the country has decades of experience in fighting separatist groups, terrorism is an evolutive phenomenon to which counter-terrorism strategies have to be constantly adapted. The greatest threat the UK faced a couple of decades ago was organized guerilla warfare originating from Northern Ireland. Today it is single perpetrators with little organizational background carrying out attacks with unconventional weapons. Just a couple of years ago, the main security concern was radicalized individuals leaving for Syria and Iraq, while now the main problem is their return. However, the UK does have a robust counter-terrorism strategy. As long as this strategy is adequately adapted to new challenges, the country will be prepared to face the threat of terrorism in the upcoming years.